As we read through the reports of neglect of dogs by Greyhound Friends, a question struck us. How many people at the kennel knew about what was happening to these dogs? 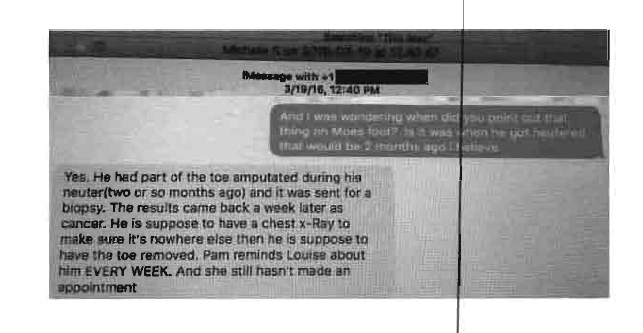 “[Moe] had part of the toe amputated during his neuter (two or so months ago) and it was sent for a biopsy. The results came back a week later as cancer. He is supposed to have a chest x-ray to make sure it’s nowhere else, then he is supposed to have his toe removed. [Dr. Josephson] reminds Louise [Coleman] about him EVERY WEEK. And she still hasn’t made an appointment." There is no evidence that Melhado, Josephson, or Shepard reported the neglect to the authorities. Melhado calls Greyhound Friends care of dogs "superior". According to the most recent annual filing with the Massachusetts Secretary of State's office, Stoddard Melhado remains at the helm as Greyhound Friends Board President. In addition, Mr. Melhado wrote to the Mass Department of Agricultural Resources stating that Louise Coleman was terminated as executive director. However, a recent news article indicates that she adopted out a dog after she was allegedly on a leave of absence -- and after the Framingham District Court judge ordered her to stay away from the kennel and not get involved with new kennel operations.